Road maps for Costa Rica refer to it as Route 126 but that’s only on paper or in pixels. As with most byways in Costa Rica, the signs that tell you which route is which are as scarce as cotingas. This is why us locals refer to Route 126 as “the road between Varablanca and San Miguel”, “the road that goes by the Peace Waterfall”, or similar descriptors. Confusing! Well hell yes! BUT, nowadays, we got Waze! That, Google Maps and other navigational apps help keep all of us birding drivers on track in Costa Rica. Although you won’t find any apps referring to Route 126 as the “Via Endemica“, they really should. 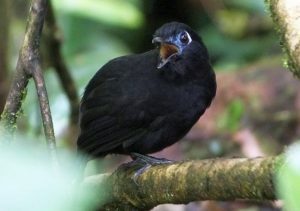 I mean where else in Costa Rica can one so readily find so many regional and actual endemic bird species (and isn’t that one of the big important things in life)? This shady species is fairly common in the Socorro area but it can go unheard and unseen all too often. On that day, we heard a few and had one very cooperative friendly male. Thankfully, this cool bird with the blue eye shadow just said no to skulking and went all in with the birding program. What do these two types of birds have in common? Not much aside from being Neotropical avian standards but the other day we did well with a pair each of uncommon becard and foliage-gleaner species. On the becard side of the coin, the cute little Barred Becard treated us well at a couple of stops, both male and female showing very well. Then, much to my surprise, we saw a rare for Costa Rica Black-and-white Becard next to the road near Cinchona! I have never seen the bird there before, I hope it’s a sign of the forest coming back and habitat improving. Regarding foliage-gleaners, we did well with two uncommon species. The Scaly-throated showed in the same flock as the rare becard and then again in a more usual spot for it, the forest above the Albergue Socorro. 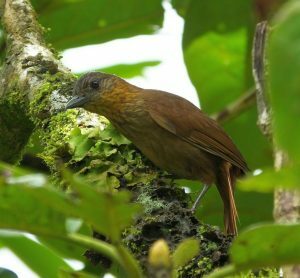 The other Furnarid was a Streak-breasted Treehunter that, like birding magic, appeared right in front of us near Varablanca. Also known as “bird waves”, “multi-species flocks”, and in some birding circles, “bird pandemonium”, this is when a bunch of birds suddenly appear, often foraging like mad and leaving shortly thereafter. It’s the bird version of dine and dash, a real feathered ambush of the senses, and the larger the flock the more likely a birder is to lose all sense of decorum. We didn’t have anything that curassow crazy on the Via Endemica, but we did do well with consistent mixed flocks and life was good. 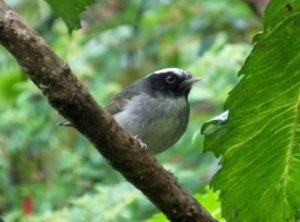 Ruddy Treerunners, Collared Redstarts, Flame-throated Warblers, Yellow-winged Vireos and other species at high elevations, and a mostly different set of birds at lower elevations. Black-cheeked Warbler was one of the high elevation mixed flock participants. The icing on the cake of the Via Endemica is the presence of the Cabanis’s Ground-Sparrow. I think we should actually it the C G Sparrow (or maybe even Calvin Gucci?) as a reflection of its cool demeanor. As with any famous character, it’s not common by any means nor easy to see but if a birder checks the right cafetales and sites, he or she may connect and even get paparazzi with this fancy towhee. The bird has been treating me well at the Villas San Ignacio. It’s sort of impossible to pinpoint where it can be seen at the hotel but it is present. We had good views of a couple of this fine G Sparrow last week. 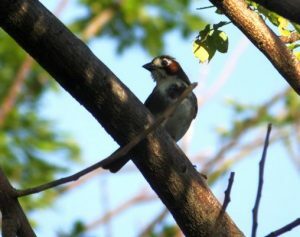 The same goes for the other snazzy G Sparrow in Cost Rica- ye olde White-eared. We also had a couple at Villas San Ignacio. I’m sure there are more highlights I could tell but the best are the ones a birders makes for him or herself. Check out the Via Endemica in Costa Rica and tell us what you see in the comments.